The last mile segment is by far the most dynamic one of a total logistics chain, from both a market perspective and a process perspective. TPR Antwerps research concerning last mile logistics started with the analysis of the B2C market and with the development of the last mile typology, based on desk research. Further on, an analysis was elaborated concerning the perceived cost effects of the last mile characteristics. For each of these areas, TRP specified two to four proxy variables. The relevance of each of the proxy variables to each of the three sub flows varied. Clearly, though, the determining factor for their applicability was the value of the goods concerned. 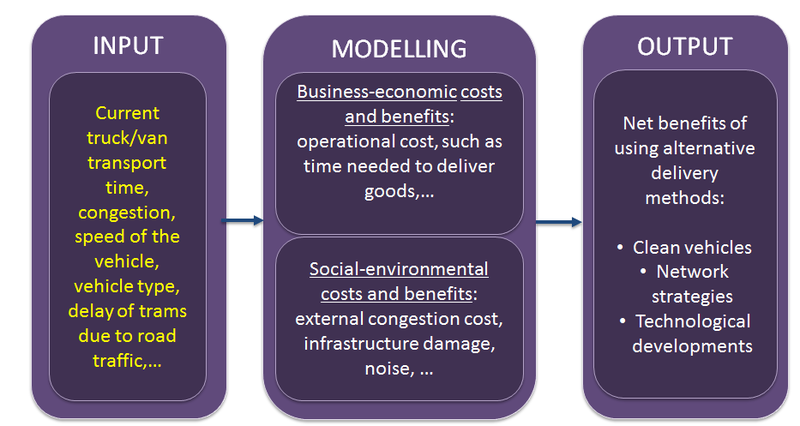 Finally, a simulation cost model/function was developed, so as to simulate the cost effects caused by changes in last mile characteristics or by policy measures taken.